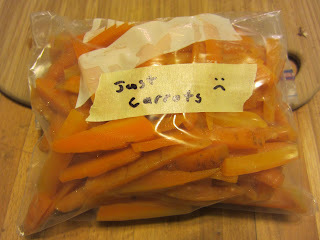 Sous Chef Brian labeled the veg, and it's not that he has anything against carrots. Whether we grow our own veggies or received too much in our CSA or scrambled to the farm market to get the last of our favorite produce before the end of the season, sometimes we end up with too much. Freezing is a great way to keep the goodness of seasons past on hand and ready for a meal. But just throwing most vegetables into the freezer isn't the best route to ensuring that today's harvest tastes fresh a few months from now. I've acknowledged that my freezer overflows with homemade foods and preserved produce and bits of things (butter wrappers for greasing pans, ends of bread for making breadcrumbs, and all the leafy, scrappy ends of things I save for stock). About once a week, I look in the fridge and figure out what's just not going to make it onto our plates in time, and then I get a pot of water boiling. A few days ago my friend Kim was asking how we do this, and I blew her off and referred her to a website. This is a bit more in-depth. Just a bit. This is slightly more serious than my "how to defrost peas" post. 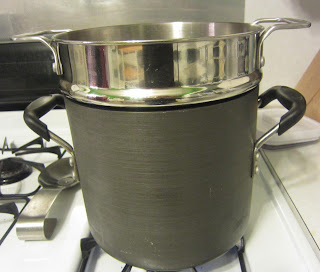 I use my biggest pot. This pot happens to have a strainer component, which is helpful but absolutely not necessary. 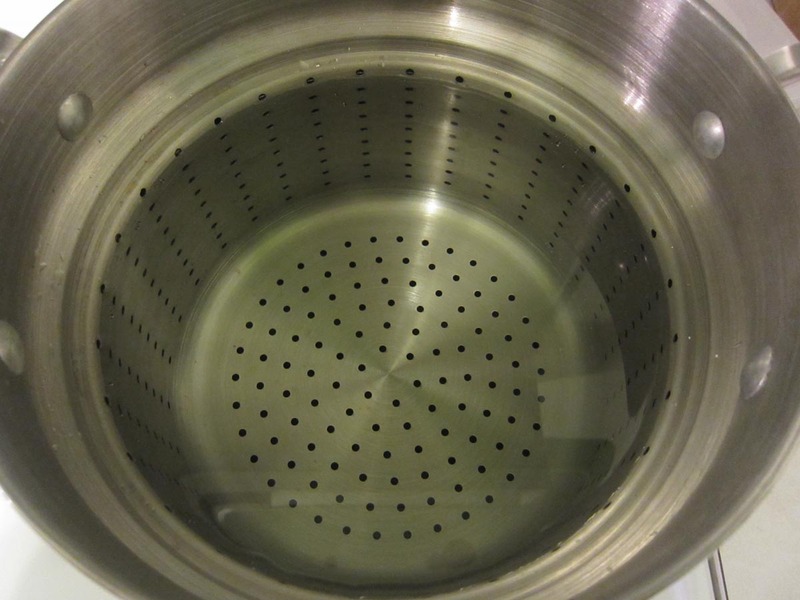 If your pot doesn't have a strainer - and really, whose does? - just be prepared to use a slotted spoon later on. I turn the heat on to get the water boiling and then I prep my veg. I'm really not one to boil vegetables, so what's going on here? Yes, I'm going to drop these nice fresh, crisp veg into boiling water, but I'm not going to cook the heck out of them and end up with something mushy and grey, I'm just blanching them to stop them from ripening. The freezer isn't magic. 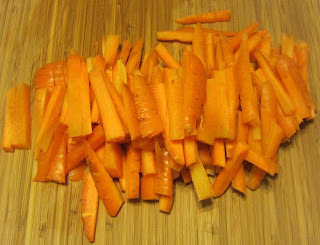 So you've got veg, let's say it's a carrot, and it's firm and crisp and wonderful, but if you wait too long, the same enzymes that caused it to ripen and turn into a delicious carrot will keep going with their ripening until they've gone too far. You've seen it happen in your fridge. 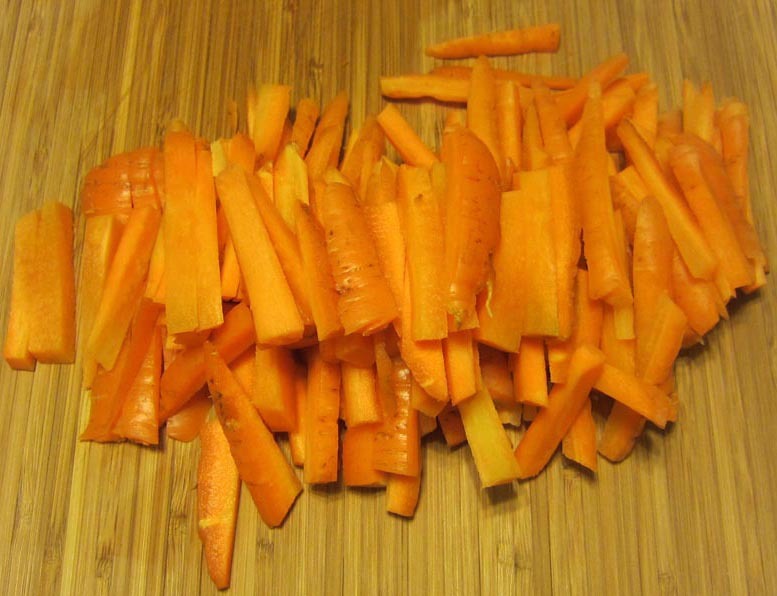 Yesterday's bright, crunchy carrot turns soft and flexible and dark. Yuck. Just freezing most vegetables doesn't stop the enzymatic ripening process, and freezing doesn't kill all of the bacteria. So, gross things can happen, even in the freezer. 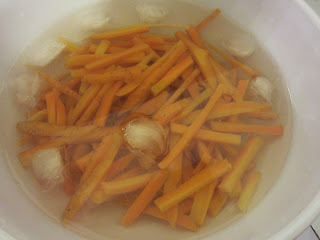 Since we want our veg to be fresh and wonderful when we pull them out next week or next month, we blanch the veg first. 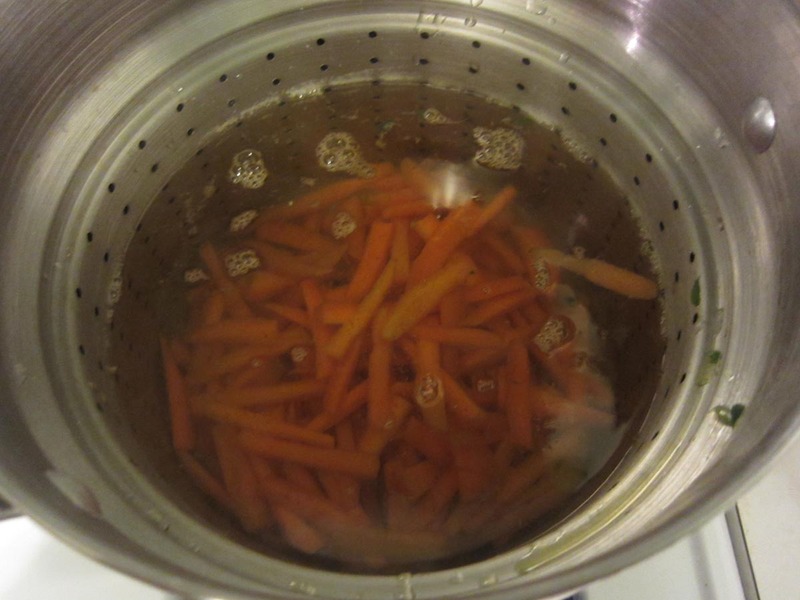 Blanching is just about boiling briefly, then chilling immediately. 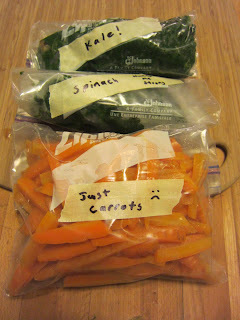 Today I have carrots, kale, and spinach to freeze. 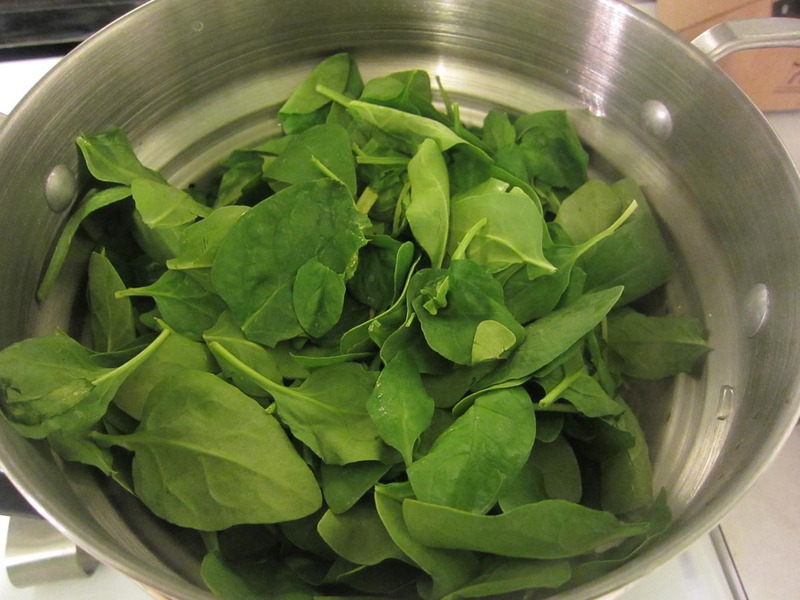 The spinach just needed a good washing. 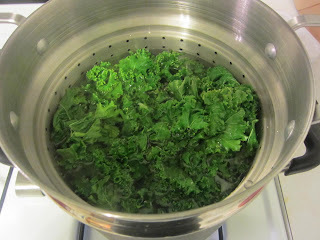 The kale gets de-stemmed and washed. When the water is boiling, we're ready to go. This is when I think about the order of things. Sure, you can use fresh water for each vegetable, but I don't. Instead I think about how the veg will affect each other. 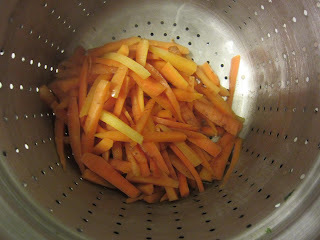 I'm going to do greens first and then carrots, because if the carrots get infused with a bit of the goodness from the greens, that's no problem, but I might not want any of the sweetness of the carrots to leech out into my greens. This probably isn't a thing, but it's something I think about. Of course, if you're dealing allergies or strong preferences in your house, you'll want to separate your veg accordingly. I dropped the kale into boiling water. Then waited for a few seconds to be sure the water had come back up to a boil, and then set the stop watch. 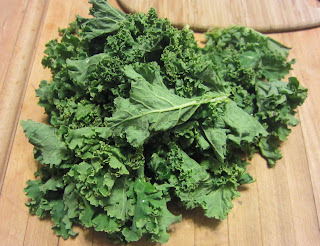 You only want the kale in there for two minutes. This is true of all greens, except collards, which need an extra minute. 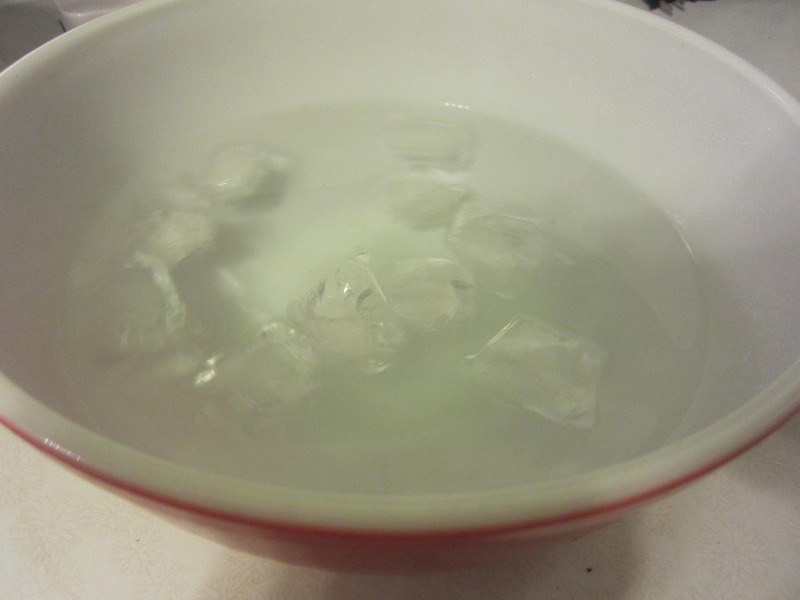 This is the time to prep your chill bowl. Cold water and ice, enough to cover your veg when they come out of the pot. When my two minutes are up, I pull the strainer basket up out of the pot. If you don't have a basket, use a slotted spoon to remove the veg. 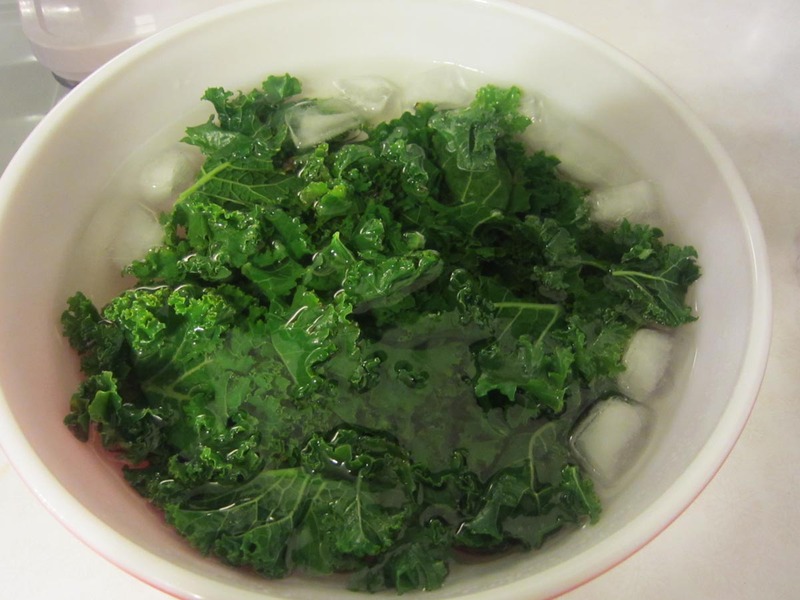 And drop the kale right into the ice water. 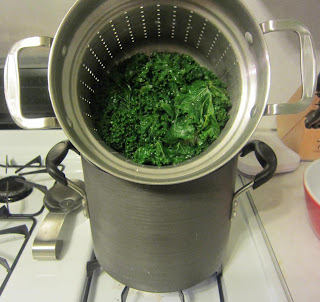 The kale need to chill in the ice water for at least as long as they boiled (2 minutes). Then I drain it - well - squeezing and such. MSNDG got me this strainer, isn't it cute? And into a zipper bag. Squeeze the air out well, and use a plastic straw if you have one handy. I like to use masking tape and a Sharpie to label them. That way when you're reusing your bag you don't have to cross out whatever was in the bag last. 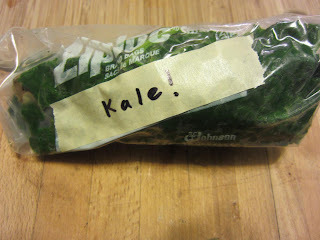 Sous Chef Brian was excited at this point in the labeling. I gave the carrots a minute longer. There is science to this (and actually, the science says just two minutes on the carrots, but I cut mine pretty big). I think Sous Chef Brian was bored with the labeling at this point. He actually does like carrots. 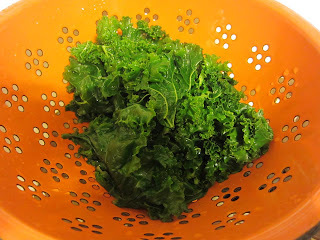 Veg like this keep a good 6-9 months in the freezer, and after that they don't spoil but they lose some of their flavor. 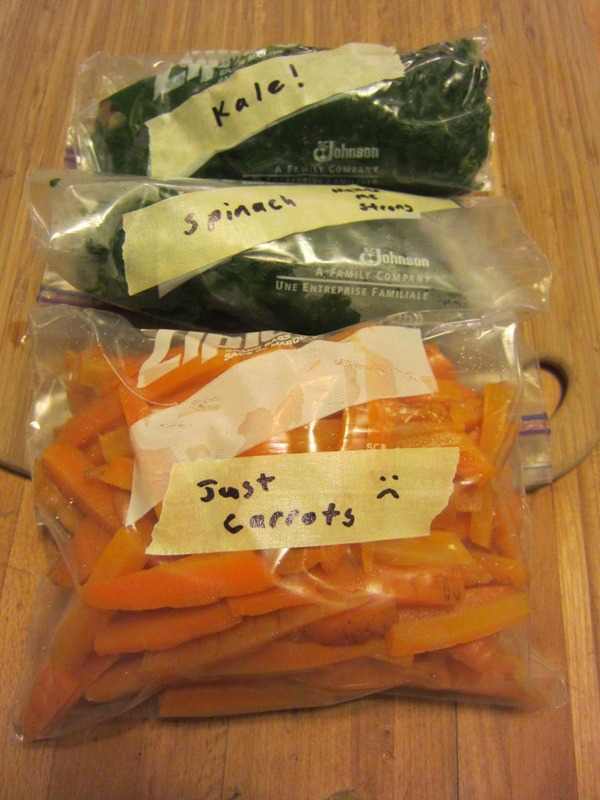 How do you know how long to blanch your veg for freezing? The Internet is your friend. The National Center for Home Preservation provides guidance on blanching and freezing, canning, drying, smoking and more. If there's a vegetable you're itching to freeze that isn't listed, just Google "blanching rutabega" and you'll get the appropriate time from something like Colorado State University Extension Center or New Mexico State University. Lots of schools have great info on preservation. Just remember, as much time as they spend in the boiling water, they should spend the same on ice before you drain them and pack them up. A few tips that should be obvious, but I've messed them both up in the past. 1. 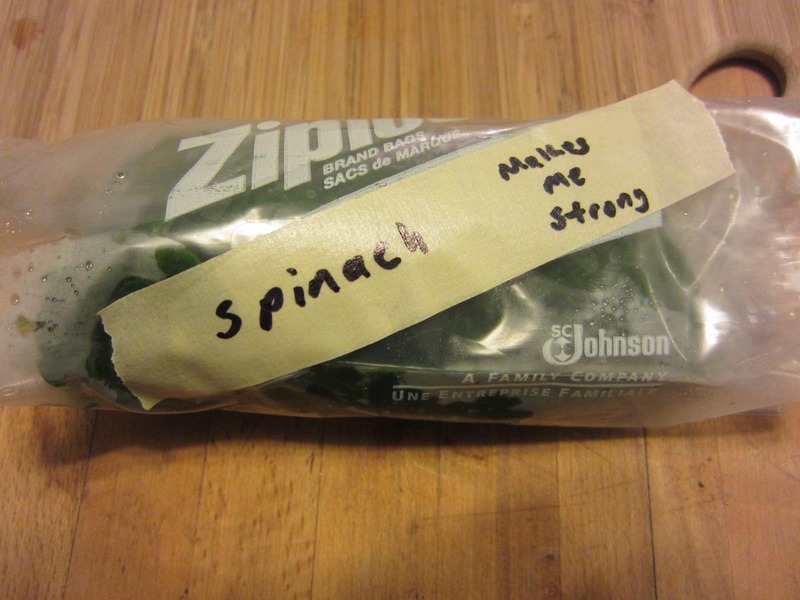 Label your veg. You don't want to think you're pulling out spinach one day and find out after the first bite that it's actually mustard greens. 2. Freeze them in the quantities you're going to want them in once they're defrosted. No, you're not going to successfully break off half a block of frozen carrots. The advanced technique, which I do when I have bigger quantities, is to blanch, drain, and then lay out on a cookie sheet (lined with parchment or silicone) in the freezer. Then, once each piece is frozen, drop them in a bag or other storage device. That way you can get at just some of them, like how your supermarket veg are frozen. 3. 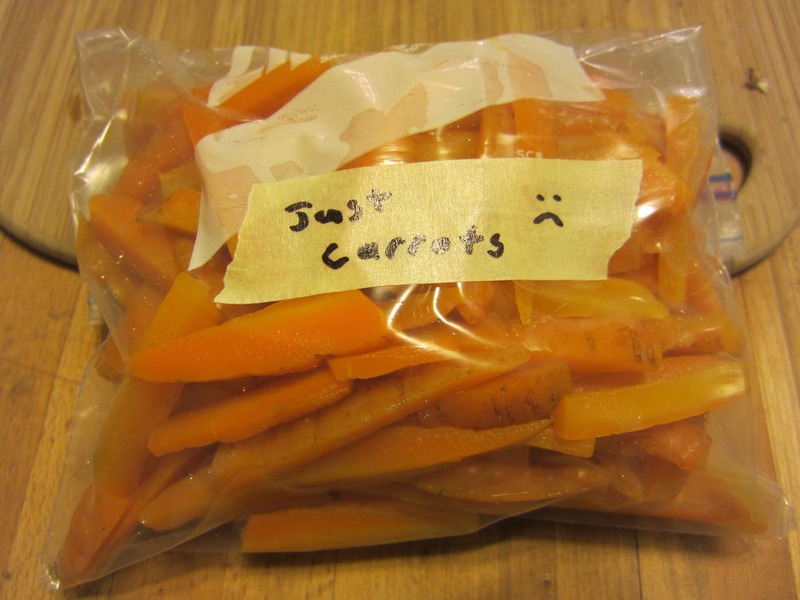 Of course, if you use your freshest veg, they'll be more delightful when you defrost them. But this is how I clean out my fridge. This is cross-posted at the blog for the South Philly Food Co-op, whose mission is to open a member-owned cooperative grocery store that provides affordable and nutritious food to all residents of South Philadelphia while empowering the local community through sustainable practices, food-centric education, outreach, and community building. Become a member-owner by filling out the application here. You could win a thing.